Last Thursday evening we gathered in Studio A for a first-of-its-kind capstone presentation produced as a talk show hosted by senior Marcus Ruiz (Bethany’s broadcasting students captured the event). The showcase featured projects by graduating seniors Kalley Hoshaw and Teal Leskey. Though both final projects were video-based and distinctly gritty, they were quite different in nature. Kalley created five promos for a television show, but not just any show. 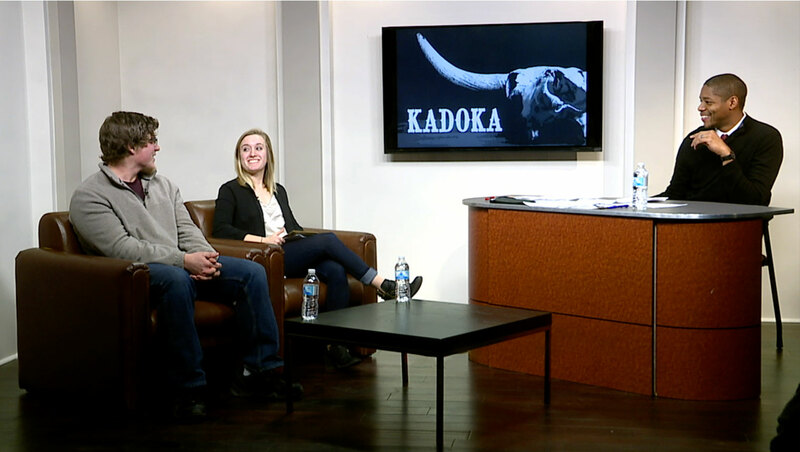 Kalley is interested in screenwriting, and she wrote the pilot (the first episode) for this series title Kadoka. She also showcased a printed “show Bible” with information about the show—the logline, setting, characters, and more from of this post-apocalyptic series set in the Badlands. Kalley was the producer/director for these promos, so she recruited fellow students Marcus Ruiz and Kenny Ramirez, Jr. to assist with her vision. Take a look at these enticing promos! In contrast to this, Teal’s project—a music video—was created largely independently. Teal has a passion for audio and has previously contributed compelling and polished sound design for other capstone projects. It makes perfect sense that he is the musician featured in this music video—an experimental piece that relies heavily on metaphor and intense post-production effects. Great work, Kalley and Teal! We wish you the best as you begin your media careers.